A very popular accessory to add instant drama to your look! 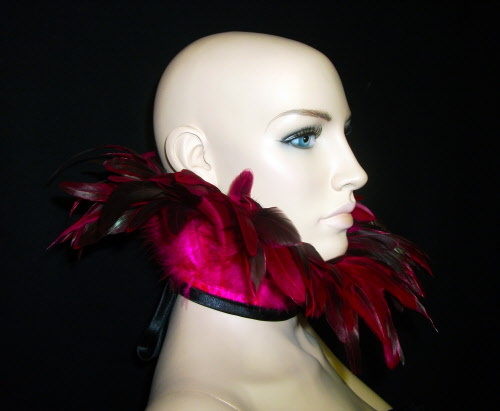 Collar of soft hot pink feathers. 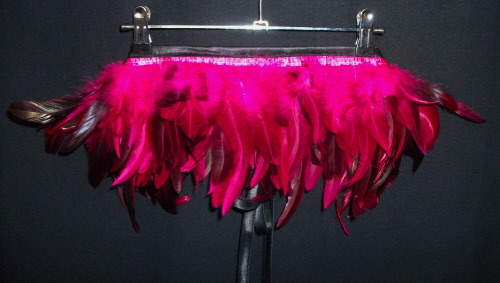 The feathers have a natural curl so can be worn prominent or "hugging" the body. 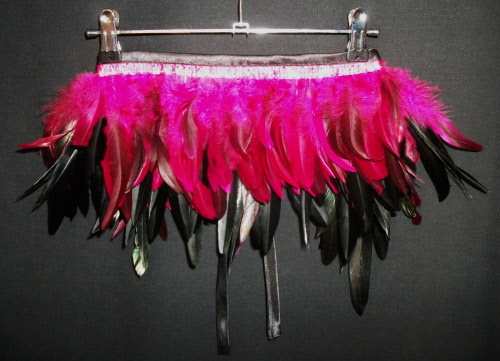 The feathers have a beautiful graduation from hot pink to almost black. The collar is made with black duchesse satin binding to tie around the back like a halter top, around the neck, around the waist or over the bust! 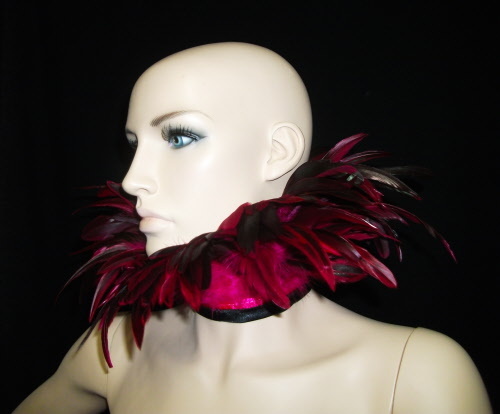 Collar of soft hot pink over natural black coque feathers. 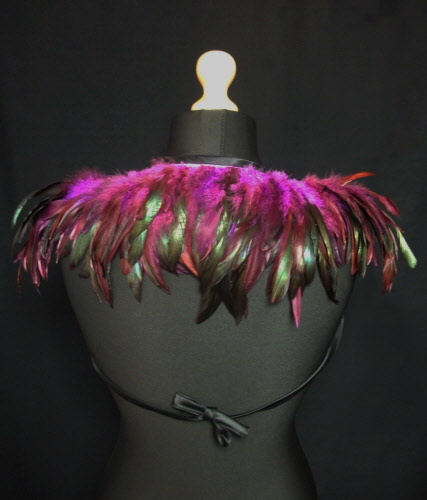 Collar of soft pale purple feathers. 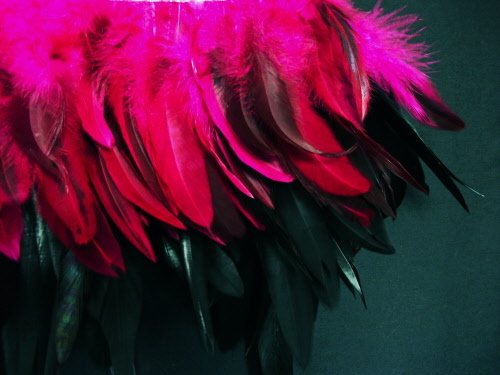 The feathers have a natural curl so can be worn prominent or "hugging" the body. The feathers have a beautiful graduation from pinky purple to almost black. 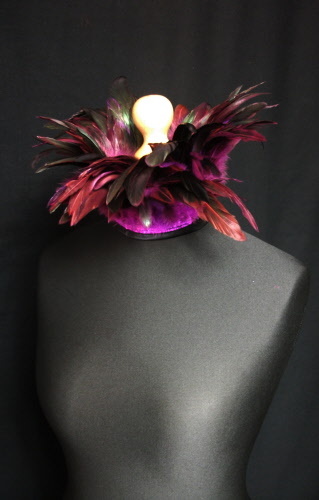 Collar of soft purple and black feathers. 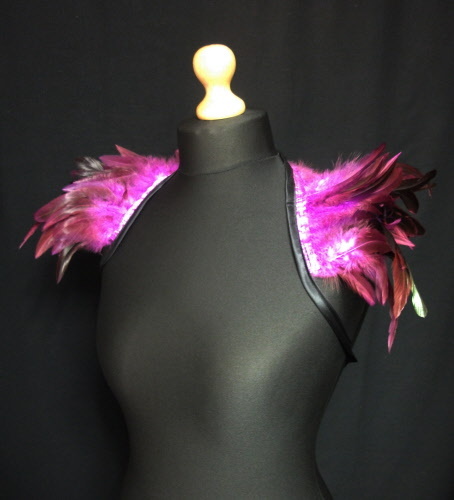 Can be worn with the short purple feathers prominent over the black, or with the black on top and purple highlights showing through. 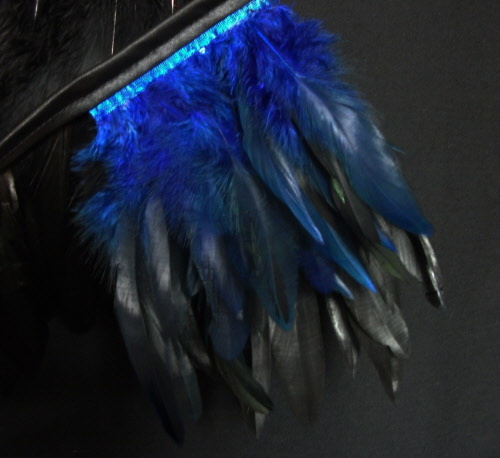 The black feathers have a beautiful natural dark green sheen that highlights in some lights. 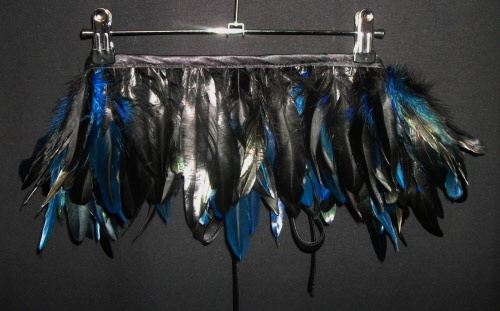 Collar of soft blue and black feathers with the blue to the outside. 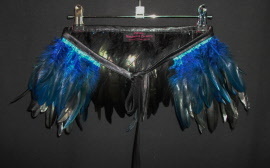 Can be worn with the short blue feathers prominent over the black, or with the black on top and blue highlights showing through. 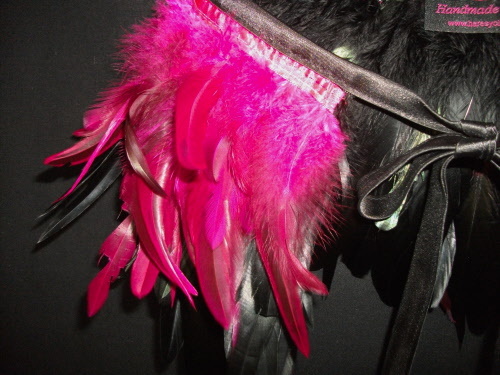 The feathers have a natural curl so can be worn prominent or "hugging" the body. The feathers have a beautiful graduation from bright blue to almost black. 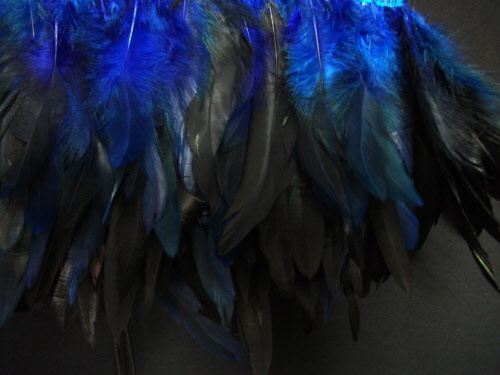 Collar of soft blue and black feathers with the blue to the inside. 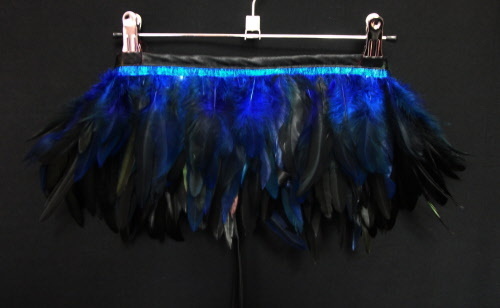 The natural "black" feathers have a beautiful natural dark green sheen that highlights in some lights. 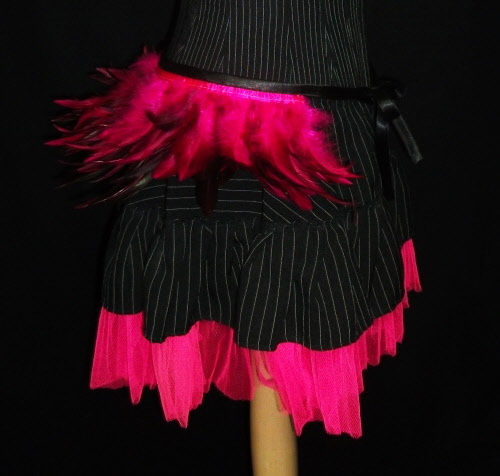 The feathers have a natural curl so can be worn prominent or "hugging" the body. 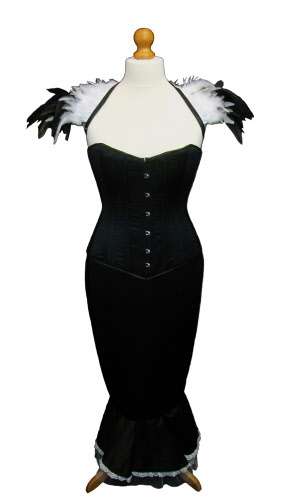 Collar of soft natural black and white coque feathers. Can be worn with the short white feathers prominent over the black, or with the black on top and white highlights showing through. 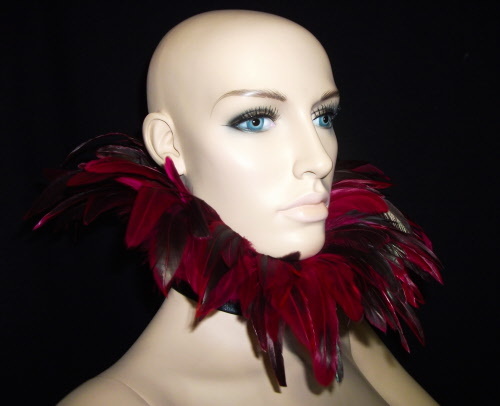 Collar of soft red and black feathers. Can be worn with the short red feathers prominent over the black, or with the black on top and red highlights showing through. 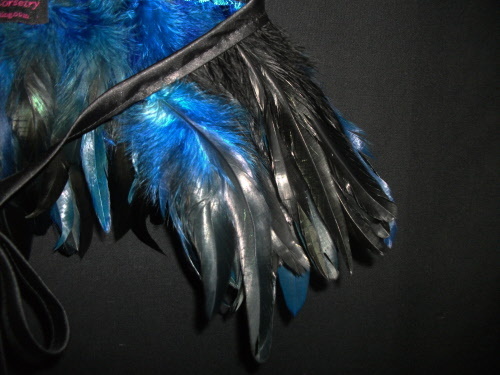 The feathers have a natural curl so can be worn prominent or "hugging" the body. The feathers have a beautiful graduation from bright red to almost black.